When I was fresh out of college and living in my first apartment in Chicago, I began my lifelong hobby of collecting recipes. One weekend I visited my college friend, Mary Ann, at her folks’ lovely home outside Benton Harbor, Michigan. 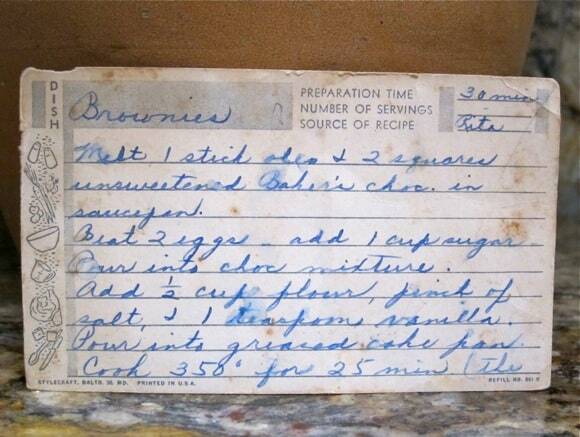 I remember chatting with Mary Ann’s mom about learning to cook and mentioned I was looking for a good recipe for brownies. Mrs. Roe promptly turned to her recipe box and handed me a card with a brownie recipe from her friend Rita. She assured me that this was a terrific recipe, one that she made again and again. Fast forward twenty years to a Kalamazoo College reunion, where I met up with Mary Ann and several other old friends. I hadn’t seen Mary Ann in almost as many years, and we had a great time catching up on news and reminiscing about college days. I asked M.A. to be sure to thank her mother for the great recipe she had given me, so many years ago, for Rita’s brownies. So, for over forty years I’ve been making Rita’s brownies and have become quite attached to the mysterious Rita, most likely long departed from this earth. I still bake from the stained and dog-eared original recipe card that was given to me long ago. I have made few changes to the recipe, other than to use unsalted butter instead of margarine. And I learned to add some coffee to every batch to intensify the chocolate flavor, long before the days of Ina Garten and her Barefoot Contessa tip. Sometimes I add nuts or a sprinkling of powdered sugar, as Rita suggests. Today, I threw in some orange zest. Mary Ann and I have been out of touch for several years, so I emailed her yesterday, told her about my blog and my plans for today’s post. She’s eager to see the recipe and I’m hoping she will make a batch of Rita’s brownies for her seven-year-old grandson. UPDATE: Just heard from Mary Ann, who remembers Rita and her son, when they were both in the 7th grade – nice. A perfect end to Mother’s Day 2013. TIP: As Rita warns on the flip side of her recipe, “The secret to good brownies is to never overcook,” so watch carefully and adjust the baking time to the quirks of your oven. Mine runs fast and hot, so 22 minutes works for me. A simple recipe for homemade brownies, with a story. Use the wrapper from the stick of butter to grease a 9-inch square baking pan. In a medium-sized saucepan, melt the butter and chocolate over medium heat, stirring as it melts. Once melted, pull the pot off the heat. In a medium-sized bowl, beat the eggs, add the sugar and mix well. Pour into the chocolate mixture. Add the flour, coffee, vanilla, orange zest and salt. Mix well and pour into greased baking pan. Bake about 25 minutes, remembering Rita's admonishment. Cool, cut and enjoy. Thanks, Rita! Thanks for the story & the recipe. I too am always looking for good brownie recipes (among others). In a pinch, my mother would make box-brownies but would add cocoa powder. I like to add instant coffee to my brownies – they don’t always breakdown when mixing, so a little pop of coffee is nice to come across when eating. Cheers ! oh – and I ALWAYS grease the pan with salted butter. 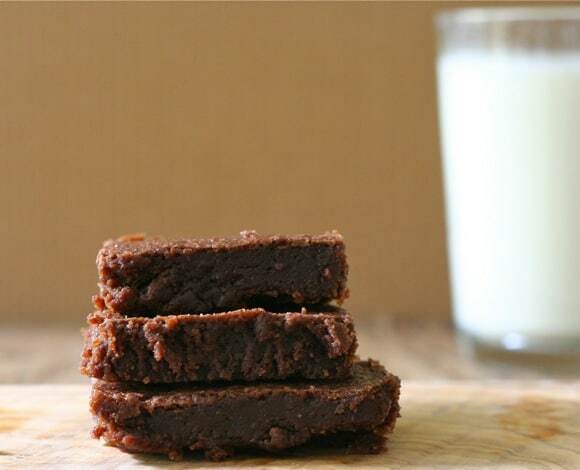 Delicious to get the crunchy salty buttery bottom of a brownie that is chewy sweet and chocolaty ! I always chuckle myself, whenever I pull out the recipe. Great back story, I do love the “Who’s Rita”? Birlliant 🙂 My Mom’s recipe was similar although she didn’t use oleo. So cute! Great photo too my friend! Great story Liz, I really enjoyed this post! “Who’s Rita” that was so funny, I wonder indeed who she was? Love your photo too! I love the story behind these brownies! I commented on these on FB, but want to add a comment here too – I really love the addition of the coffee and orange. Thanks, Susan, they were a hit with the birthday boy too. Love the old recipe card and the lost connection to Rita – great story and recipe Liz! Hope you had a beautiful weekend. Glad you liked the story, Beth – yes, a beautiful weekend indeed. Liz, this is such a sweet post! The recipe reminds me of my grandmother’s Congo bars, but yours uses less flour. I’d like to give these a try with gluten-free flour. I’ll report back once I do. Maybe for Monday’s lunch?! Okay, I love those dog-eared recipe cards. I have a few myself. Yeah for Rita and those brownies look gooey and delicious. This is such a simple yet heartfelt recipe because of the story. A mysterious bite of brownie and many wondering thoughts. I think the reason they used margarine back in the day and well even today is because it is more affordable. I’d say if you see a recipe with butter it probably came from a more affluent family. I think I might just do a taste test and see if there really is a difference. I agree, except that we didn’t have a lot of money when I was growing up, but my Mom could not abide the taste of margarine – and she was the chief cook and baker.